Removing the design constraint is clearly of value to product makers, and continues to drive major developments in display manufacturing. Over the last decade, we’ve seen the arrival of gently curved glass LCDs – bendable to about a 1 metre radius – and flexible OLED displays, which can be conformed to a few millimetres radius for smart phones and smart watches. Organic LCDs (OLCDs) will be the next major step forward when they enter production in 2019, enabling both large and small LCDs to be manufactured on plastic for the first time. The aesthetics of the product are often determined by the display. Flexible displays offer exciting opportunities to product designers, allowing the display to follow the surface contours of the product housing. Flexible displays can also effectively be made borderless by folding the edges away, allowing the development of laptops or tablets with truly stunning screens. In the case of OLCDs, it’s also easy to make apertures – physical holes – within the screen itself, enabling seamless integration of the display with other functions. Consumers often make their buying decision on the aesthetics of a product, and there is huge potential to change the form of products in ways never previously imagined. The most beautiful aesthetics in the world will soon be forgotten if the product is difficult or irritating to use. Flexible displays, if applied well, can make products more comfortable to use. They can allow wearable devices to sit more comfortably around your wrist, for example, or allow larger infotainment displays to be incorporated into vehicles, making them easier to read without sacrificing space for passengers. And, of course, plastic screens will also make tablets and laptops much lighter to carry. Environmental considerations throughout a product’s life cycle – from manufacture and use to disposal – are becoming increasingly important in customers’ buying decisions. While there are many factors that make up the complete environmental profile of a product, there are some clear advantages in moving to flexible, plastic displays. Weight is perhaps the most obvious benefit: flexible displays can easily be 10 times lighter than their glass counterparts, reducing transport costs. And these benefits are compounded for screens fitted in vehicles. Take in-flight entertainment (IFE) screens for example. The weight savings from swapping to plastic displays can save hundreds of dollars per seat in fuel over the life of the IFE system (read more). And similar benefits can be gained by switching the various LCD screens in cars to plastic. In the case of OLCD, there are also significant gains in terms of energy consumption during manufacturing of the actual display. OLCDs are manufactured at much lower temperatures (100 °C) than today’s glass displays (400-500 °C). Combined with other process simplifications, this represents a major energy saving during production (read more). Display lifetime is obviously an environmental consideration, but can also be an important design consideration for many applications where the display is embedded. For example, home appliances might be expected to last for a decade, but displays used in automotive applications need to last as long as the vehicle, while enduring a wide range of temperature in operation. Today, nearly all flat panel displays in cars are based on LCD technologies, which can withstand these conditions. Product lifetime therefore needs to be considered when moving to flexible displays. For example, today’s flexible OLED displays struggle to meet the lifetime requirements for automotive applications, and this issue is exacerbated by the high level of brightness required in cars – as this impacts on the lifetime of OLED pixels. On the other hand, OLCDs are based on many of the same materials and components as existing automotive LCD displays and, like glass LCDs, can be made very bright without affecting the lifetime. Currently, flexible OLED displays are expensive to manufacture, which is why they are generally only seen in high end products, such as flagship smart phones and smart watches. Costs will, of course, come down over time, but this issue will be exacerbated for larger display sizes, making it difficult to use this technology in applications such as home appliances, laptops or TVs for the foreseeable future. OLCDs have been developed specifically with this issue in mind. Using a display structure similar to traditional glass-based LCDs, the technology allows large display sizes to be made cost-effectively. This makes it feasible to create flexible, conformable displays for use in a wide range of applications, providing huge differentiation and margin opportunities through the supply chain. In the next few years, we will start to see flexible displays in nearly all the applications where glass displays are used today, as well as many new uses that are only possible if displays can be wrapped around existing, non-flat surfaces. 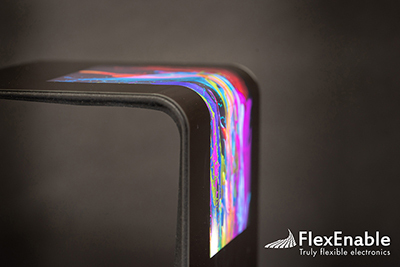 FlexEnable is working with its supply chain and manufacturing partners to bring its exciting OLCD technology to the market, creating a world of new possibilities for curved and flexible displays. For more information on OLCD, please get in touch with us at info@flexenable.com.